Love ginger? 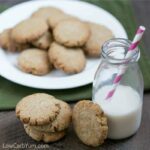 These soft gluten free ginger cookies are low carb and keto friendly. They are very similar to gingersnaps without the crispness. When it comes to holiday cookies, I like to keep them simple. For my keto sugar cookies and low carb cream cheese cookies, I prefer making a log with the dough to make easy slice and bake cookies. So rather than make up a batch of gingerbread cookies that has to be rolled out and cut into holiday shapes, I went for an easier recipe. And I even came up with a gingerbread loaf recipe which is even easier than baking cookies. 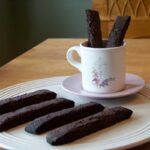 I used to love snacking on gingersnaps in my high carb days. 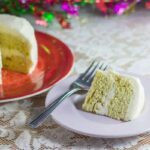 That’s why I created a low carb gluten free ginger cookies recipe to make myself keto friendly holiday treats. Unlike gingersnaps, the cookies are soft and a bit cake-like. But I actually enjoyed them this way so the recipe is a keeper for me. However, using all almond flour would likely result in a crisper cookie. I adapted an old recipe in my collection to make these classic holiday cookies. 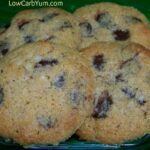 In order to make the cookies low carb and gluten free, the wheat flour was replaced with a blend of almond flour and coconut flour. The sugar was also replaced with low carb alternatives. Since ginger cookies typically have molasses, I added a little bit of Sukrin Gold Fiber Syrup. But, a low carb maple flavored syrup would work too. And you can just leave the syrup out all together if you prefer. 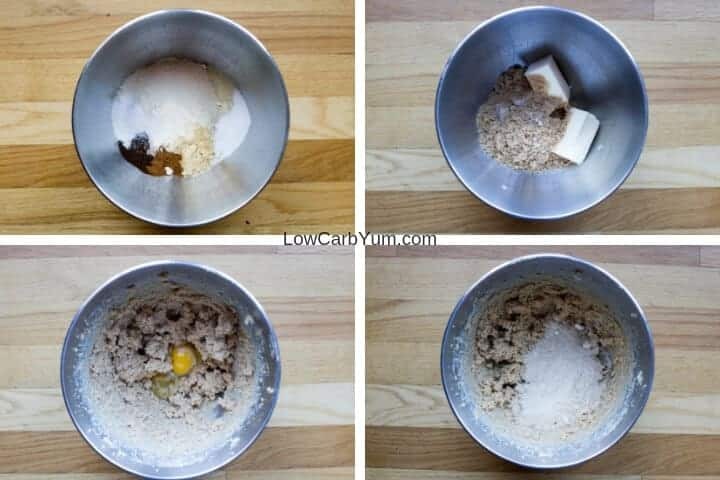 To make the gluten free ginger cookies, I combine the dry ingredients in one bowl and the wet ingredients in another. Then the dry ingredients are slowly added into the wet ingredients to form a dough. The dough is divided into evenly sized scoops which are formed into balls. For a “sugary” coating, the balls are rolled into granulated low carb sweetener. This gives the cookies a festive sparkle on the outside and adds some additional sweetness. Finally, using the bottom of a drinking glass, the balls are pressed flat into a circle. Then, they are baked at 350°F for 8-10 minutes until the edges have browned. 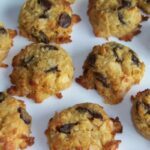 Although I usually use a ratio of 3 parts almond flour to 1 part coconut flour, I increased the coconut flour in this recipe for a lighter cookie. When replacing regular flour, it’s usually 3-4 parts almond flour to 1 part coconut flour. Cookies made with all almond flour tend to be denser and crunchier. On the other hand, cookies with all coconut flour are softer and more cake-like. That’s why using a combination of these two low carb flours is a better replacement for wheat flour. However, the ratio used can be adjusted to more almond flour for crisper cookies or more coconut flour for softer cookies. Adding molasses to ginger cookies results in a soft chewy cookie. 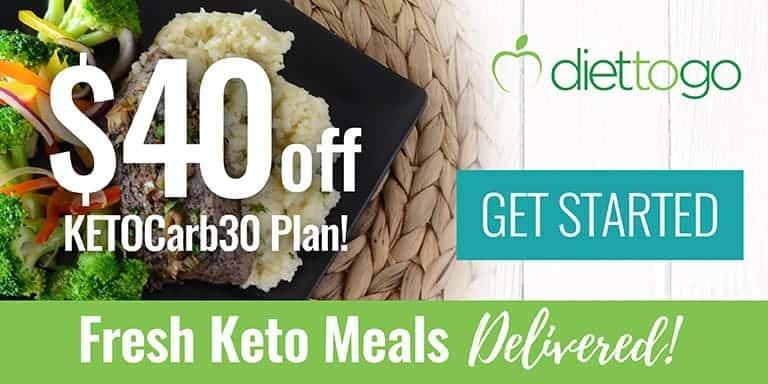 But for low carb, you don’t want to add more than a touch as it’s a high sugar ingredient. 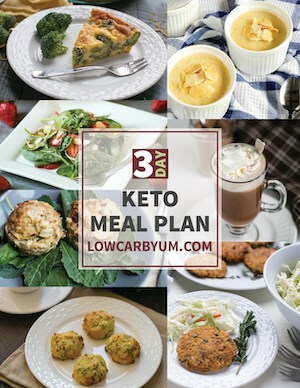 And for keto, it’s best to leave it out completely. 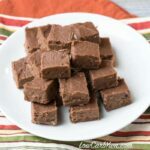 Low carb alternatives to molasses include fiber syrup and low carb maple flavored syrup. Sukrin Gold Fiber Syrup is what I added to the cookie, but a zero carb maple flavored syrup would work as well. 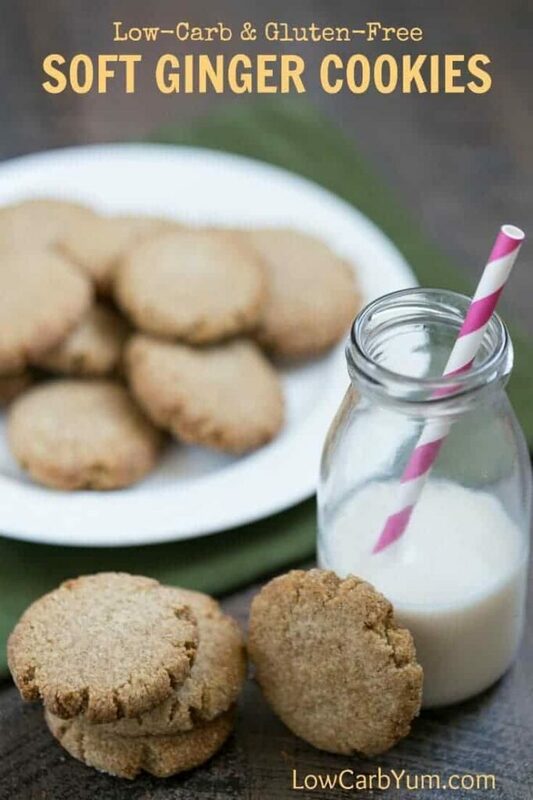 These gluten free ginger cookies are a soft baked cookie. A little more tweaking would be needed get them more like a regular crispy gingersnap cookie. More almond flour, less coconut flour, and omitting the fiber syrup should result in crisper cookies. 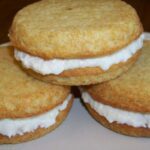 The taste of the cookies is very good so I wouldn’t change the sweetener amount or spice blend. But the texture of the cookies could be adjusted by replacing some or all of the coconut flour with almond flour. 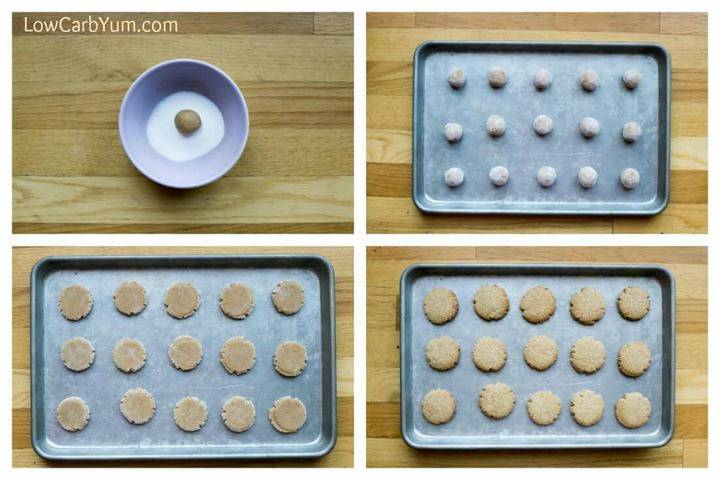 Rather than roll in granulated sweetener, the cookies could be iced or glazed instead. The cookie dough isn’t overly sweet so a little added sweetener on top shouldn’t require reducing the sweetness in the dough. 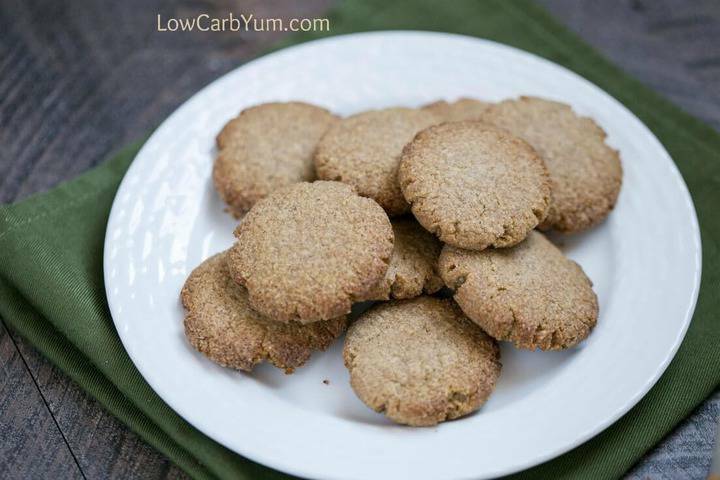 This is a great recipe to include in your collection of low carb holiday cookies. 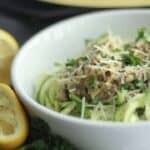 And, it goes well with almond macaroon cookies or healthy chocolate zucchini cookies. Love ginger? 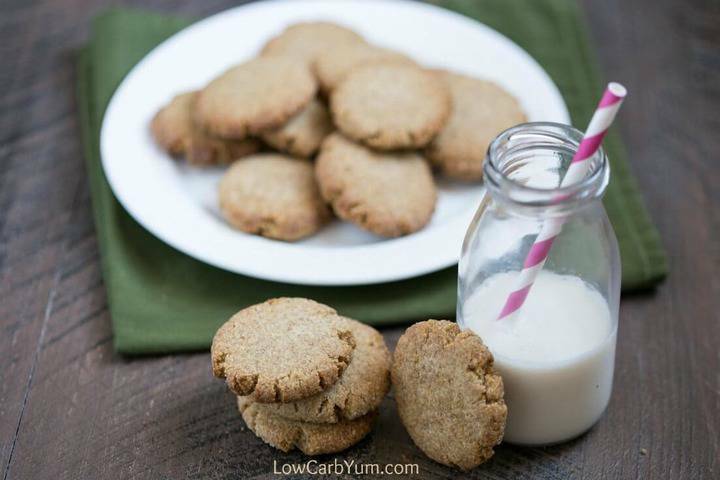 These soft ginger cookies are made low carb and gluten free. They are very similar to gingersnaps without the crispness. In large bowl, combine almond flour, coconut flour, baking powder, ginger, cinnamon, cloves, and salt. In another large mixing bowl, cream together butter and Sukrin Gold. Beat egg into butter mixture and Sukrin Gold Fiber Syrup (if using). Slowly add dry mixture into butter mixture. Knead into a dough. Scoop into balls and roll in Sukrin:1 if desired. Place dough balls or scoops onto parchment paper lined cookie sheet or use non-stick silicon baking sheet leaving with adequate spacing (about 1 1/2 inches). Press each ball down with flat bottom glass. Bake at 350 F for about 8 to 10 minutes. Makes about 42 cookies with about 2 g net carbs per cookie. Some or all of the coconut flour can be replaced with almond flour for a crisper cookie. 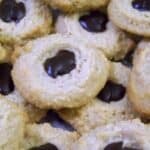 The cookies can be drizzled with a simple glaze or low carb frosting. 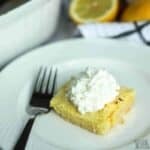 Mixing a little powdered sweetener with water works as an easy low carb glaze. Post updated in December 2018. Originally published December 2010.